The Three Value Comparison interface asset enables you to compare three values. Both text and numeric comparisons are possible. Your choice of operator - see below - will depend upon the comparison you would like to achieve. The following image shows an example of how one might use the Comparison interface asset. Result: contains the result (true or false) of the comparison between value A and B using the selected operator. There is one specific action for this interface asset. 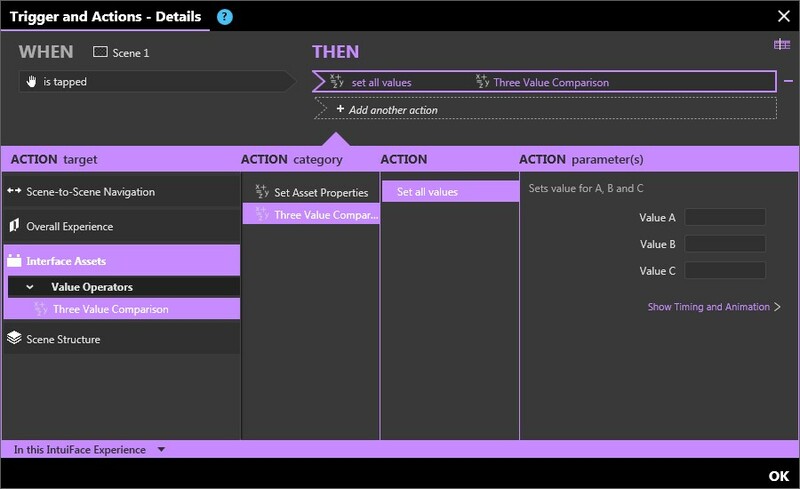 Set all values: Sets value for A, B and C.
In addition, the generic Set asset properties actions are available for the purpose of changing Value A, Value B, Value C and the Operator. This Three Value Comparison is used in our Slot machine and the Multiple item scratchcard game samples to decide if the user has won or lost, depending of 3 input values.